When do I use Vector Art? 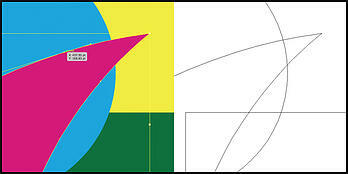 Vector art is the use of geometrical primitives such as points, lines, curves, and shapes. Vector art is made up of lines (referred to as paths) that are connected by anchor points. Think of a connect-the-dots drawing that can include curved lines. Each path and anchor point is defined using mathematical equations. Which means that moving, scaling, or rotating this type of art does not degrade the quality, instead it recalculates the equations. The information needed to translate these images also translates to a relatively smaller file size compared to pixelated (or raster) artwork, such as digital photographs. Vector art is ideal for printing. Since the art is made from a series of mathematical equations, it will print very crisply even when resized. For instance, a small vector logo can be used on a business card and then enlarged to billboard size while keeping the same smooth quality. A raster graphic would blur or pixelate excessively if it were enlarged from business card size to billboard size. Vector art also produces perfect, crip results when used for different projects such as vinyl decals, engraving or embroidery. Provides a Macbook Pro and access to the Adobe Creative Cloud to students for the length of the program for online assignments. At Specs Howard School of Media Arts, we can train you for the graphic design industry. Fill out the form and one of our Admission Representatives can help put you in the right direction to begin learning more about the world of graphic design.